Yue says "Last time on..." as we get a recap of darkness and light. The episode begins with Eli repeating (though in a calmer tone) that if she fails, Yue and Keroberos will be trapped in the staff forever. Sakura is sent crying and insists she can't do it. Yue puts her hand on her, telling her that they completely believe in her. Keroberos reminds her that the cards are loyal, and she too must believe in them and herself. She wipes away the tears, and prepares herself. 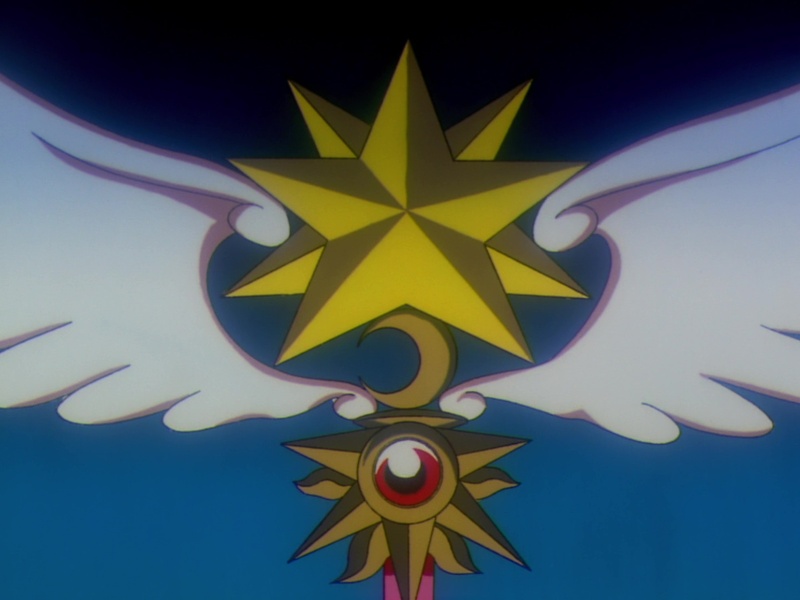 The guardians' essence upgrades the staff into a longer form with 9-point stars separated by a crescent moon ◊. And it seems this time, Light and Dark draw their power from her might rather than light. The glowing aura rises slowly over the cards, but halfway through, the light falls. Strengthening her conviction, it rises again, but she could use a little help from a friend. Li grabs onto her, channelling his magic into her despite being terribly exhausted. Together, their magical essence rises up to finish the job. Let there be light! The morning sun has vanquished the horrible night. Li falls, but is greatly relieved they did it. Keroberos and Yue return as good as ever, and Yue smiles as Sakura thanks them. Madison finally wakes up, remembering not a thing, but Tori is still tired. Yue assures Sakura he'll wake up soon. Eli and the dark guardians float down. Sakura's guardians brace themselves, but Eli assures them it's all over. Sakura, you've won! The Star Cards circle around her and fall into her hand as a deck, with the Light card face-up on top. All of them created by Sakura's inner star. She holds them close to her heart. This time though, Keroberos thinks this doesn't call for celebration, but an explanation! But of course Eli has already vanished. Mr. Terada announces that Eli Moon will be transferring back to England and since his flight leaves first thing in the morning, he can't be with them in class. The trio decide to visit his house one last time. You know, I'm surprised no one noticed something strange about a 12-year-old kid with a mansion all to himself for all this time. Mysetriously, the doors automatically open and the candles light up as they walk forward. As they arrive in his room, banners and confetti go off! Surprise! Ruby politely instructs them to take a seat for the tea party, but Kero is still peeved. "We didn't come here for tea! We want some answers!" Eli tells him to relax. Over tea, Eli recaps the whole ordeal from his perspective, interspersed with flashback after flashback. Some of these are only tangentially related. If I never see another flashback again, it'll be too soon. Anyway, he remarks on how Sakura faced many challenges and how she had to come up with her own incantation. She learned how to harness her star's powers, but he had to give her a lesson in patience after she tried to transform 8 at once. Not at all like when she tried to transform 8 for the final test. Kero (finally) realizes he was the one behind this all along! Eli explains that he had to create these disturbances since there wasn't much time before the cards would lose their magic. Sakura remembers he helped her fly. Li yells at him that he wasn't the Clow, so how'd he do it? He then gets up and introduces a special guest: Ms. Mckenzie! It turns out she went to England to assist Eli with the mission, reminding her that she could only help without revealing the truth. Kero finally enacts revenge on Spinner by pounding biscuits into his mouth, and Eli suddenly remembers that Yue isn't present with them. He walks out to go get him. Yue still demands an answer to his question: if he was going to be reincarnated, why did he force them to choose a new master? Eli matter-of-factly states that he may have some of his memories, but he is not Clow Reed. The real Clow Reed is never going to appear on this Earth again. That may have seemed obvious to him, but Yue didn't want to believe it because he was like a father to them. "I miss him so much." Eli slowly walks over to him, explaining that he was so tough on Sakura to make sure she was worthy of being their master, and they indeed chose well. Clow Reed's wish was to test her, and now it's Yue's duty to protect her. As Sakura walks home, she sees Li on the lonely road. On the bridge, Li has an important confession to make: he has to go home. He tells her that he knew he could do it as the proven master, and maybe he wasn't needed after all. Sakura insists that she couldn't have transformed the Light card without him, and wishes that he could stay. But alas, that was not to be. Sakura walks to her room, depressed at the fact that he's gone. Suddenly, her tear creates a powerful magic force resulting in the birth of a new card. The last intimate notes ring out as she gazes at the card ◊, on which later on, the word HOPE shows up written as its name. Well, the Star Card Arc is finally over. Can't say I'm not glad for that. This concludes the Nelvana dub. It'll be a month before I can get to the Bang Zoom! Entertainment dub of The Sealed Card, but in the meantime, I plan on writing up a Nelvana dub FAQ. If you have any questions in regards to how the dub was handled, feel free to leave them in the comments and I'll do my best to answer them (and depending on the question, I'll add it to the FAQ).